Nelson Bay’s newest public art project has been unveiled this week, bringing colour and vibrancy to Apex Park and Yacaaba Street. The Walk of Art celebrates and showcases the talent of local artists by turning street banners into hanging canvases. The works of Anna Webster, Denise Duffy, Ian Marriner, Kimberly Swan and Matthew Johnstone are featured on 12 street banners along Apex Park’s walkway and the new Yacaaba Street extension. Port Stephens Mayor Ryan Palmer officially opened the Walk of Art on Monday morning. “Public art is a great way of telling a story about our community. This story is a colourful one – inspired by the natural beauty found all around us in Nelson Bay,” Mayor Palmer said. “The Walk of Art will give locals and visitors something truly beautiful to look at as they enjoy Apex Park or wander down the new Yacaaba Street extension. “But more than that, public art fosters community pride, gives a place a sense of belonging, and importantly, improves our quality of life. “This is just one way that Port Stephens Council, through our Nelson Bay Next campaign, is helping to revitalise Nelson Bay. “I want to thank the artists and the local businesses who have made this project possible. Your support has made Nelson Bay a more vibrant and beautiful place to live, work and play,” he added. 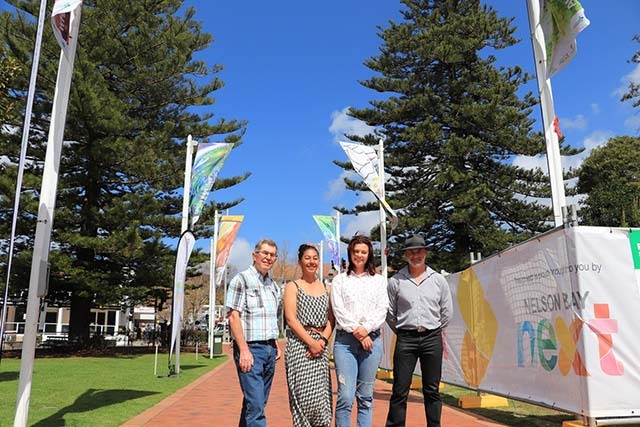 Walk of Art has been made possible with funding from Regional Arts NSW Country Arts Support Program and the support of local businesses Tomaree Business Chamber, Hotel Nelson and Place Property Management. Find out more about the Port Stephens Walk of Art.